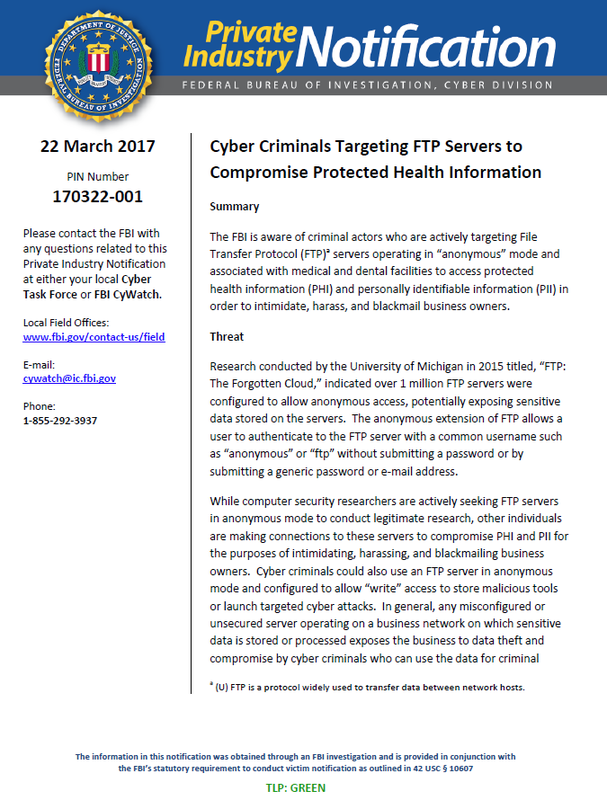 Research conducted by the University of Michigan in 2015 titled, “FTP: The Forgotten Cloud,” indicated over 1 million FTP servers were configured to allow anonymous access, potentially exposing sensitive data stored on the servers. The anonymous extension of FTP allows a user to authenticate to the FTP server with a common username such as “anonymous” or “ftp” without submitting a password or by submitting a generic password or e-mail address. While computer security researchers are actively seeking FTP servers in anonymous mode to conduct legitimate research, other individuals are making connections to these servers to compromise PHI and PII for the purposes of intimidating, harassing, and blackmailing business owners. Cyber criminals could also use an FTP server in anonymous mode and configured to allow “write” access to store malicious tools or launch targeted cyber attacks. In general, any misconfigured or unsecured server operating on a business network on which sensitive data is stored or processed exposes the business to data theft and compromise by cyber criminals who can use the data for criminal purposes such as blackmail, identity theft, or financial fraud.